The winner of Coras2013 was announced at the red-carpet Awards Ceremony last Thursday, held at the Hilton Newbury Centre Hotel. Shawn Khorassani, the founder of Coras and a local entrepreneur, chose Fields of Fun as a start-up company to be awarded £10,000 cash and mentoring for a year. 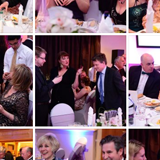 One hundred guests, including the Mayor and Mayoress of Newbury, Cllr Arthur Johnson and Miss Kathryn Humble and the local MP, Richard Benyon, gathered at this glittering gala evening, the like of which has not been seen in Newbury before. The fourth business was presented by a local couple, Gary and Julia Brown of Track Your Ltd. They confidently introduced their range of tracking devices. 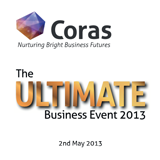 Coras2013 was supported by over twenty local companies. Derek Rogers of Gardner Leader commented on the evening: ‘It was both inspiring and fun and superbly organised. I have no doubt that all five finalists have taken a lot from the process which will be of a real benefit to them in the future. Sam Harper of Coras said: ‘We were overwhelmed by the success of this event and the number of comments and responses within 24 hours after it, requesting the continuation of this initiative.